Favorably placed skywatchers in western and central Europe will get a rare opportunity tomorrow evening (April 29) to watch as the space shuttle Endeavour – on its 25th and final mission into space — appears to fly in formation with its giant external fuel tank shortly after launch. 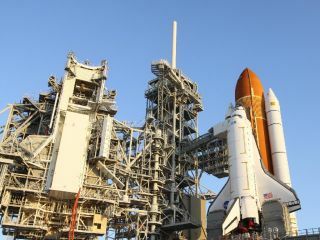 Endeavour is slated to launch Friday (April 29) at 3:47 p.m. EST (1947 GMT). The shuttle and its discarded fuel tank will first appear in the west or west-northwest part of the sky and then appear to streak rapidly to the south and east. The shuttle and the external tank will be visible as separate entities, each appearing as bright "stars" sailing across the evening twilight sky. Endeavour will appear as the brighter of the two objects, and will shine with a yellow-white glow, while the external tank will glow with a distinct orange hue. Many Europeans enjoyed a similar spectacle during the previous launch of Endeavour, on July 15, 2009. The viewing circumstances for the upcoming launch will be even more favorable than in 2009, when Endeavour and the fuel tank ultimately ducked into the Earth’s shadow and disappeared as they moved across the sky. For tomorrow's launch, they will be passing over Europe less than an hour after sunset. As a consequence, they should be visible for a much longer interval of time. Unlike the shuttle's solid rocket boosters, external tanks are not reuseable. They break up before impact in the Pacific Ocean away from known shipping lanes. The tanks are not recovered. Endeavour will continue into orbit en route to the International Space Station. It appears that neither North America nor Europe will have any views of the shuttle as it “chases” the ISS in preparation for docking. By Sunday evening, Endeavour will be docked to the space station, and both will appear as a single bright moving "star." To reach the station, Endeavour must be launched when Earth's rotation brings the launch pad at Kennedy Space Center into the plane of the station's orbit. For the STS-134 mission, this will happen in the middle of a 10-minute launch window from Launch Pad 39A at 3:47:52 p.m. The docked Endeavour and space station will be making evening passes – visible after sunset – across southern Canada, most of Europe and the United States during the first week of May. Those living across southern Canada may have visibility only for the first few days of May, while those living across the southern United States will continue to have viewing opportunities until about May 10. Hawaii will have several opportunities beginning May 5. There won’t be a view from Alaska. Endeavour is expected to undock from the International Space Station on May 11 at 6:23 a.m. EST (1023 GMT). Both space vehicles will be seen as separate entities and will be visible at about the same time as they sweep across the sky. Hawaiians will get to see that sight, too, but North Americans and Europeans will not, since both the shuttle and the space station will be passing by in the daytime hours during the second week of May. Hawaii will have an opportunity to see both objects flying separately on the evening of May 11. Beginning at 7:45 p.m. local time, they will appear to track along a low arc above the southwest horizon for about three minutes. From Australia, Endeavour and the space station will be making passes before sunrise. Early risers in Melbourne can hope to see both Endeavour and the station pass almost directly overhead on the morning of May 12. At 5:45 a.m. that morning, the two space vehicles should emerge from the Earth’s shadow, dramatically appearing initially very high in the western sky, taking two minutes to track toward the northeast. Because of its size and the configuration of highly reflective solar panels, the space station is now, by far, the brightest human-made object in Earth orbit. On favorable passes, it's as bright as magnitude -5, which would rival even the planet Venus and would outshine Sirius, the brightest star in the night sky some 25-fold. Some have even caught a glimpse of the space station in the daytime just prior to sunset or shortly after sunrise. And as a bonus, sunlight glinting directly off the solar panels can sometimes make the space station appear to flare briefly to super-brilliance. The space shuttle also appears as a very bright (magnitude 0 to -1) object, almost matching Sirius, though nowhere near as dazzling as the space station. Each will ask for your ZIP code or your cit, and respond with a list of suggested spotting times. Predictions computed a few days ahead of time are usually accurate within a few minutes. However, they can change due to the slow decay of the space station's orbit and periodic reboosts to bring it to higher altitudes. Check frequently for updates. Another great site is this one, which provides real-time satellite tracking and will show what part of the Earth the space station or shuttle happens to be passing over at any given time. Whether you catch a view of Endeavour flying independently, or while it is docked to the International Space Station, keep in mind that this will be your very last chance to see it in Earth orbit. Endeavour was the shuttle that was constructed to replace NASA's lost Challenger orbiter. Endeavour's maiden flight into space came in May 1992 as part of the STS-49 mission to retrieve the Intelsat VI satellite, which had failed to leave low-Earth orbit two years before. The STS-49 astronauts attached the satellite to a new upper-stage rocket, and it was relaunched to its intended geosynchronous orbit. The STS-49 mission also marked the first time that three people from the same spacecraft walked in space at the same time. What a debut it was for America’s newest shuttle at the time! Over the past 19 years Endeavour has been launched 24 times; this upcoming flight of STS-134 will be its 25th and final vault into space. Endeavour is scheduled to land back at the Kennedy Space Center at 9:28 a.m. EST on May 13.